David’s work involves regular trips to France, especially to Paris and Strasbourg and day-to-day contact with the French Navigator ministry from his home in Southampton. David became a Christian in 1972 while studying for a degree in French and German in London. It was here that he first met the Navigators. After completing a postgraduate certificate in education, David began to teach French and German in a local Cardiff secondary school and led one of the Cardiff Navigator university hall group ministries. It was during this time that he began attending Heath Evangelical Church and subsequently became a member. In 1979 he moved to France where he helped pioneer Navigator student ministries in Strasbourg, Paris and Toulouse. 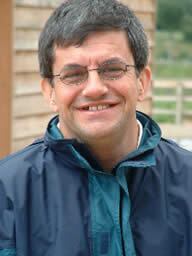 After 18 years cross-cultural missionary experience in France, David returned to the UK in 1997. Since then, he has travelled to France on a regular basis to give pastoral support and encouragement to French Navigator trained laymen and women seeking to have an impact for Christ as insiders in mainstream French society. The book of Acts and the Epistles mention many people such as Titus, Timothy and Tychicus who were committed and available to strengthen and encourage local labourers and communities in their faith. Such people are sometimes referred to as mobile alongsiders from the Greek word for encourage, which has the sense of being called alongside or calling from alongside. They played a crucial role in the advance of the gospel in New Testament times. Having stood down from 12 years as National Director in France, David now has a travelling ministry to support, strengthen and encourage some of the key labourers and leaders in the French Navigator ministry. Christian ministry in France is tough and thwart with challenges. French Christian leaders often feel isolated and forced to face these challenges alone. The ministry of encouragement is to walk alongside some in such a way as to counsel, encourage, exhort and urge so that local leaders find the courage to persevere in their God-given ministry. David is excited about his role as an alongsider as he contributes to the advance of the gospel in France, by walking alongside a number of French Navigator ministry leaders in their ongoing spiritual journeys. From small beginnings with students in Strasbourg in the 70’s, the French Navigator work has been seeking to advance the gospel of Jesus and His kingdom into every segment of French society and into the nations of the world. Within this broad vision, the focus has been to invest deeply in the lives of a few, so that generations of labourers might be multiplied. We are trusting God for French men and women who live authentic lives of love and grace, in their homes, workplaces and community who are seeking to make a permanent difference wherever God places them, out of a deep desire to know Christ and to make Him known. 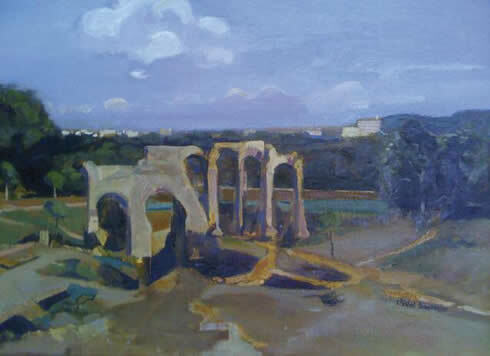 The above oil painting represents the Roman ruins at Saintes, a small town in the south west of France. I really like this painting, not so much for any intrinsic artistic value, but because I find it often prompts me to reflect on the spiritual state of France. The vast desolate foreground creates a strong feeling of sadness and melancholy, reminding us of a former glorious past, now fallen into ruin. What will be the future of these ruins? How will they be rebuilt? Without spiritual labourers ready, equipped and committed to rebuilding the spiritually ravaged cities of France, the situation will remain the same and without hope for the future. For more than 40 years, the Navigators in France have been seeking to fulfil our God given mission of training and equipping spiritually qualified labourers, who would invest in the lives of the spiritually needy people of France. Today, Navigator trained labourers are seeking to rebuild the ancient ruins wherever God has placed them as insiders in mainstream French society. In our student ministries in Strasbourg and Tours, groups of students meet weekly to study the Scriptures together. Elsewhere in France, Navigator trained labourers seek to share the life-changing message of the gospel with friends, neighbours and colleagues. Some are responding, others resist, and the progress of the gospel often appears slow. Yet God is at work and the gospel moves forward as He continues to work in the hearts of French men and women. Investing personally in the lives of individuals is a painstaking and laborious process. Much faith is required in the face of seemingly meagre results. But such is the challenge that God has given us, as we seek to co-labour with Him in the spiritual needy and desolate waste cities of France. These modest beginnings sometimes seem so small, compared to the challenge of the work that remains to be done. The promise that God gave me for France more than 40 years ago, is a great challenge and encouragement to persevere: The least of you will become a thousand, the smallest a mighty nation. I am the Lord; in its time I will do this swiftly. Isaiah 60:22. This is a long-term vision that God alone can accomplish, but He invites us to co-labour with Him! No longer will violence be heard in your land, nor ruins or destruction within your borders, but you will call your walls Salvation and your gates Praise…Then will all your people be righteous and they will possess the land forever. They are the shoot I have planted, the work of my hands for the display of my splendour. Isaiah 60:18-21. Many thanks to you all at the Heath, for your precious prayers and partnership in the work of the gospel, as we seek to rebuild the ancient ruins, restore places long devastated and renew the ruined cities of France.